It’s been a hell of a season so far. 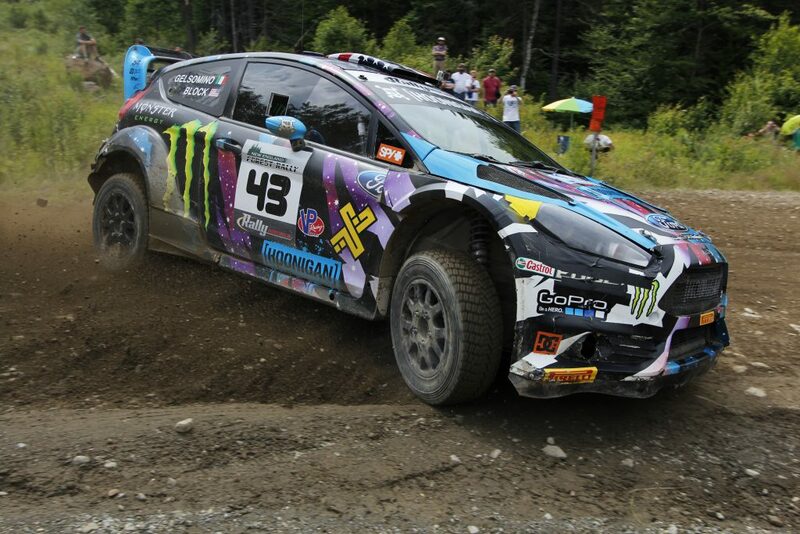 After DNF’ing LSPR last fall, Sno*Drift was a “warm up” and the only intent was to have a clean rally. It would turn out that we would walk away from Sno* with the highest speed factor we’d see for a while, which came with its own set of problems on top of the mechanical (technological) issues we were having. Said set of problems with speed factor has even been outlined by David Higgins, most recently at NEFR. Namely, its ability to place you too far away from other class competitors, resulting in an uneven battle under different sets of conditions. 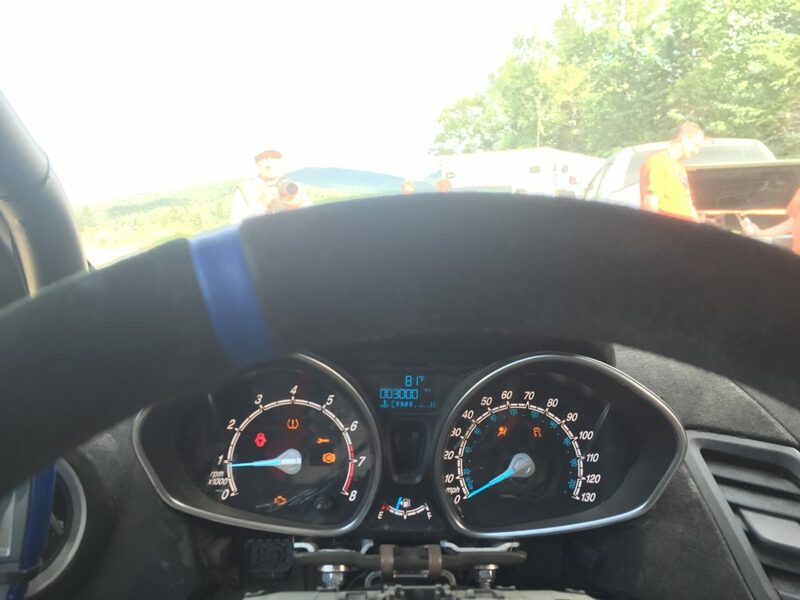 Despite not quite getting up to pace at Olympus as I learned the car’s quirks, I did manage to end up within a second of Jordan on one of the stages and finally see an improvement in speed factor from Sno*Drift, which helped our road position for STPR immensely. At STPR, we saw a ten point increase in speed factor, which helped a lot more, as it was on par with Jordan’s average. NEFR is also the “home rally” for those of us based out of Team O’Neil. And while I hadn’t competed in it, I had some knowledge of it going in, which took off some of the stress. But NEFR is rough and known for its large rocks and boulders. However, we tend to do quite well on rough. Friday starts out with three classic stages. The first is Concord Pond, which happens to be Cameron Steely’s favorite stage in the whole series. Concord is fast and flowing with some jumps. As the first stage, and overall a trickier one for our car to handle, we were under pace, but we finished the stage with only 7/10ths of a second separating us from Jordan. On SS2, South Arm N, we had the leg up, with a stage win by two seconds. 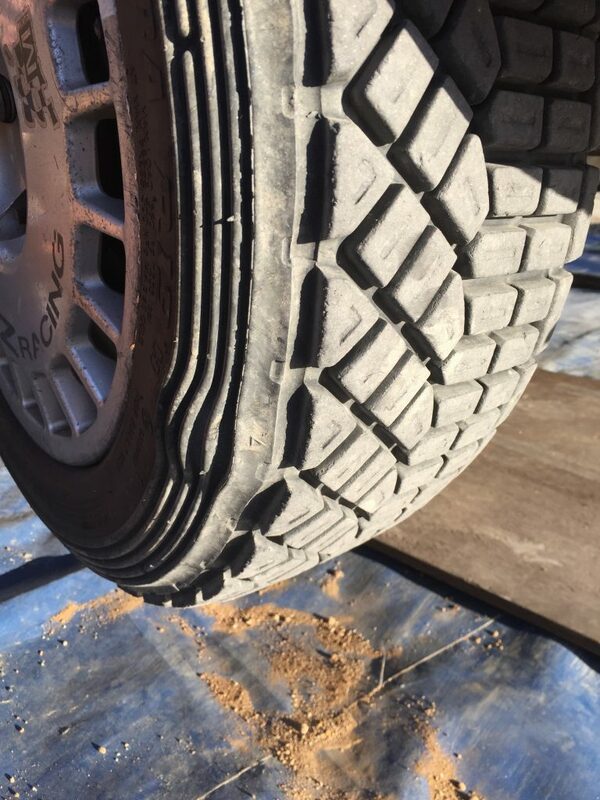 The limits of a production class became more obvious in SS3, Icicle Brook S, as we lost a bit of top-end power between the high temps outside and pushing hard. I tried to cool the car down by easing off for a while, but eventually made the call to push through it. We lost the stage by just under seven seconds, not to my surprise. So after the first three stages, it was five and a half seconds that separated us. Saturday begins with a loop of three stages that is later repeated. SS4 was Aziscohos, a ‘new’ stage this year, though part was used in the past, including the Hurricane Brook bridge, which is somehow much bigger than I ever realized on recce or during the race. Jordan had us by twenty-three seconds on it, a bit more than I would have thought. B17 was next, another new stage this year. The Fiesta seemed to struggle a bit on this one, and I was surprised that we had only lost the stage by seven seconds. Then came Sturtevant, previously Fish Pond, my favorite stage of the rally. 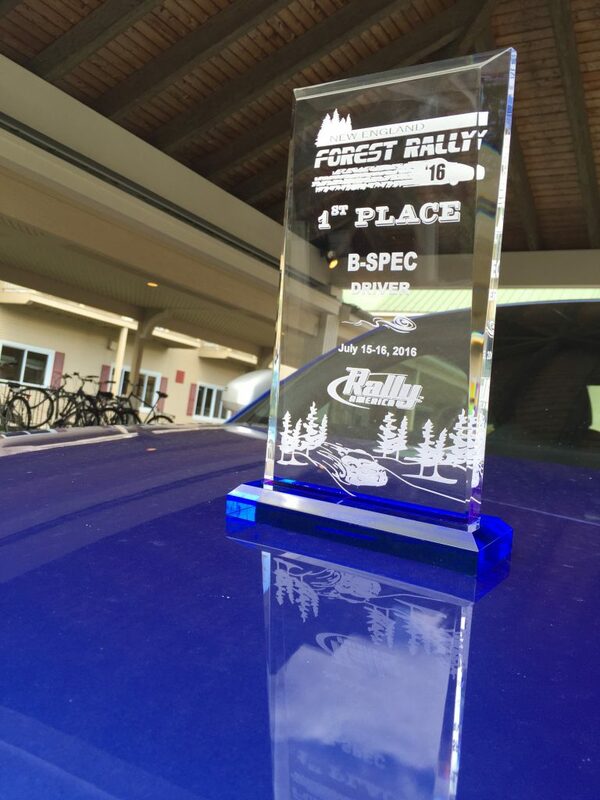 We won the first pass of Sturtevant by thirty-one seconds, leaving us just over five seconds apart after six stages and sixty-four miles. For the next leg of the rally, we were to complete the same three stages again, though this time, Sturtevant was first, followed by Aziscohos and B17 last. On SS7, Sturtevant II, a few things didn’t go in our favor. The first I will refrain from speaking about, the second, was coming around a corner to dust, through the dust was a bit of bright orange, and faintly, someone running through the dust. Ole and I had the same thought, that something BIG had happened and got slowed way down only to realize that it was ‘simply’ a spectator in the road, and the dust was from the Honda Fit directly ahead of us. After losing a minimum of five seconds, I worked to catch up. Once there, due to the thick trail of dust, Jordan couldn’t see us, nor could we see the road. This prompted Ole to suggest I slow down, because he couldn’t see. Frankly, neither could I, but I was driving as quickly as I could with hardly an idea where the road was going (aside from the limited insight provided by the notes) with the sole thought of making it past and gaining as much time as possible. We finished the stage only one second slower than our first time through, a testament to the speed I gained through the first part of the stage, despite the scenarios we experienced. After we had passed, I kept the pace up, reminding myself that if we were to take a hard hit on any rocks, we could lose the time we had just gained. Once we arrived to Aziscohos II, Jordan and Billy were no longer in tow. I realized we would have even more time to spare, as they would be accruing additional time in penalties for being late to the ATC for SS8, in addition to whatever was slowing them down. Since Aziscohos and B17 were harder on the car the first time around, it made sense to drive a comfortable pace and not make the car work through it as hard the second pass, and only lost ten seconds to ourselves on SS8 and five seconds on SS9. The final stage of the rally was North Road. At a short four miles, it was time to have fun. We went across the flying finish just moments after the car’s odo rolled over to mile 3000. In the end, the gap was six minutes and forty seconds. We finished with a fourth place in 2WD and my first stage rally win, exactly one year after deciding to come into rally for a full season. This put us ahead in the championship by just one point going into the final two events of the season. Perhaps more exciting was Cameron Steely and Preston Osborn’s third place on the Overall podium, especially since Cameron had never finished both days of NEFR. Steely and Osborn started NEFR tied in the championship with Ryan Millen and Christina Fate. They now have a five point lead after their NEFR win. Steve and Alison LaRoza finished third in 2WD and were finally able to complete a stage with full power after a season packed with electrical issues.